Tucked away at the Rockwell Powerplant Mall is a foodie spot that combines seafood, gourmet meats, whole grains, fresh vegetables and pita with the distinctive flavors of the Mediterranean region. 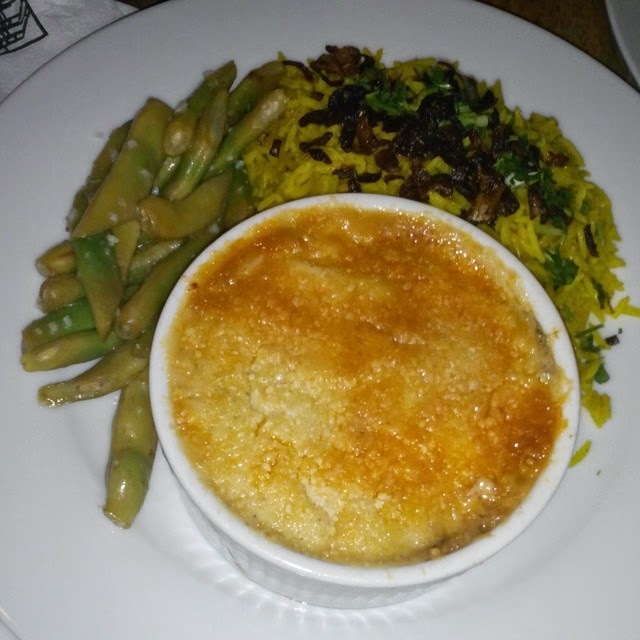 While Café Mediterranean dishes are priced higher than its competitor, it is still at the affordable end of the spectrum. I find their food as "heavenly". I loved the flavors as it playfully danced inside my mouth. 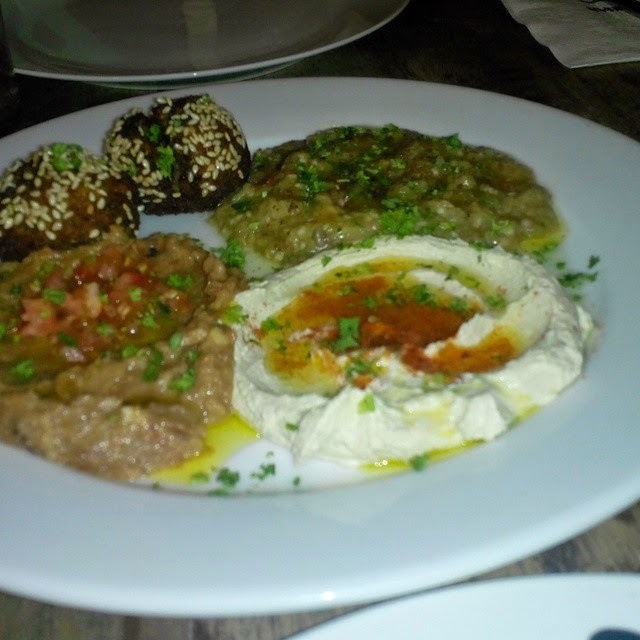 Sampler Platter lets you taste Moutabal (spicy Lebanese dip made from eggplant), Hummus (chickpea-dip), Tzatziki and other nice condiments for gyros or kebabs. It goes very well with pork or lamb and makes a good appetizer. To me, Panini (grilled sandwiches) are the end-all, be-all of sandwiches. 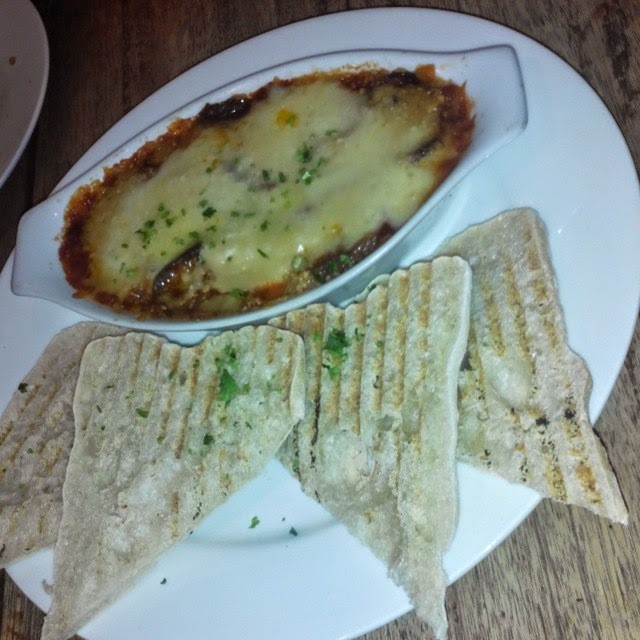 Its crunchy bread, eggplant and melted cheese dripping down the edges gives an amount of immense enjoyment. 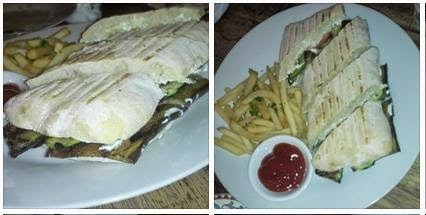 Though I have a preference for meat dishes, I find these tangy Mediterranean vegetable panini surprisingly delicious. Using garlic sauce and a bit of their chilli sauce makes it more appetizing. Pizza Mediterrenea (P 365) is a vegan pizza sprinkled with sun-dried tomatoes, grilled eggplant, zuchinni slices and black olives. 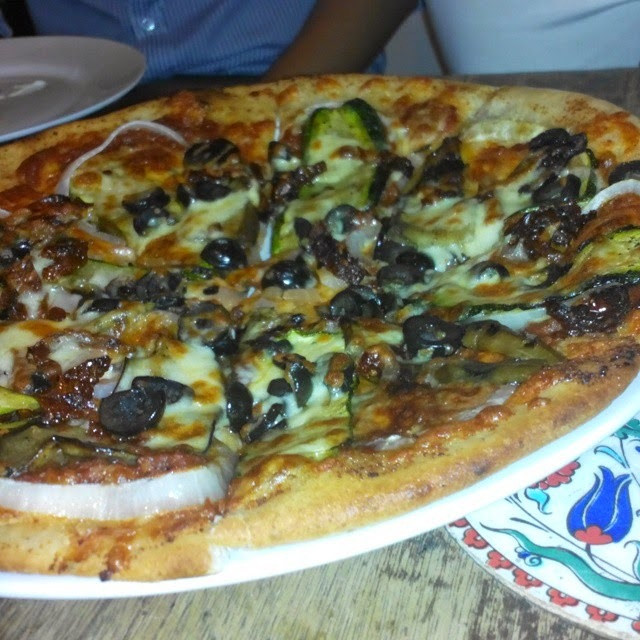 You may opt to add anchovies (P 385). Moussaka's texture and taste was very unique. I brings back memories of my childhood spent in the Middle East. This Greek dish of layered eggplant ground beef really something special. 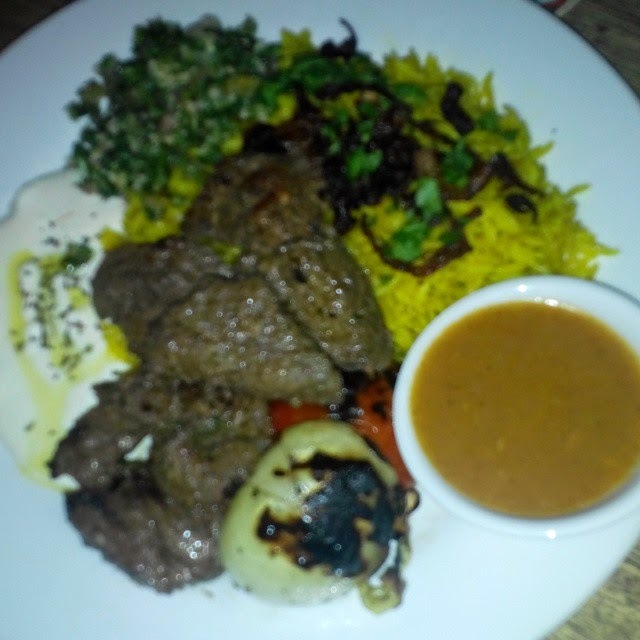 Café Mediterranean offers a large menu of traditional Turkish dishes and it is particularly strong on kebabs. Shish Taouk are Lebanese Chicken Skewers. These tender chunks of char-grilled chicken meat are love! 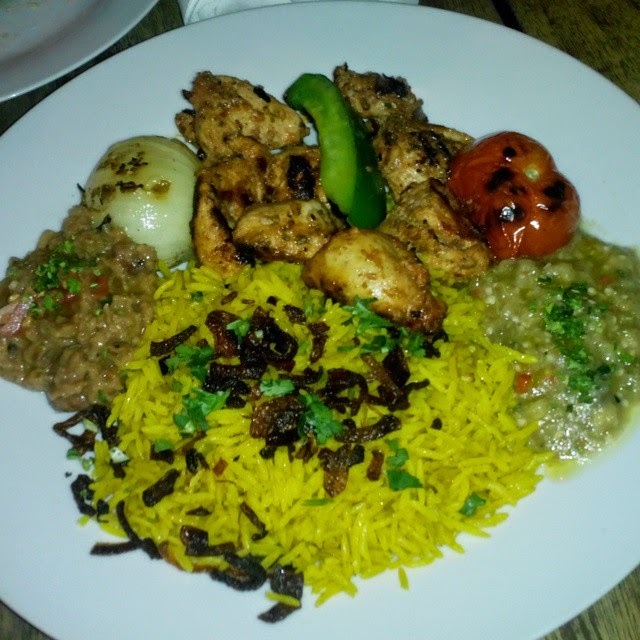 While most shish taouk are served with a pita on the side, you may choose to go for gyro plates which gives you the option to add buttered rice, Moroccan pilaf (rice is cooked in a seasoned broth), Biryani or Couscous. Each gyro plate is served with Moutabal, Tzatziki and Pickled Chillies that adds creamy, tangy richness to every bite. Beef Kebab with Buttered Rice (P 270) is my other favorite. The meat is fresh and the food is lovingly homemade. You'll know it when you eat it. Café Mediterranean is a place I would recommend to get a nice dinner kebab. 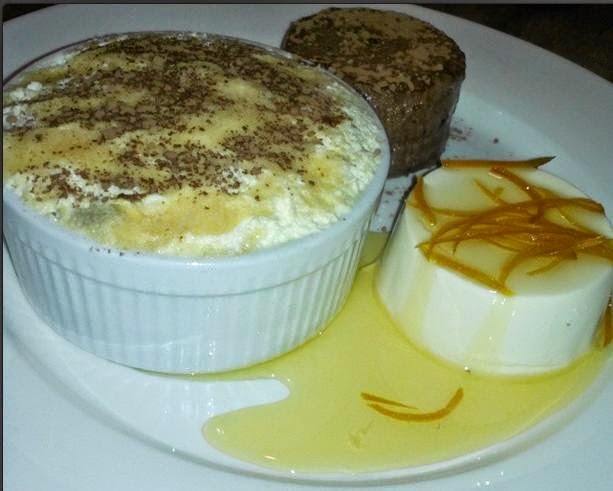 While a bit pricey, it offers a slew of healthy dishes incredibly well and very tasty indeed! You will feel at home in this Mediterranean gem.